"The Tomb" is the 62nd Mandrake Sunday story. The story was written by Lee Falk and drawn by Phil Davis. Midnight in a graveyard, Narda pursues her wind-blown hat when a skeleton's hand came out of a tomb and grabbed her. 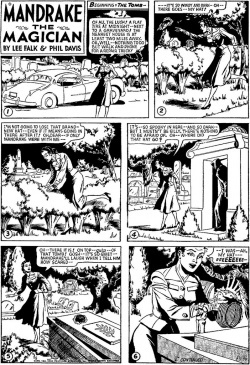 The story title is from the strip of May 23 and 30, 1954 (Next Week: The Tomb ! / Beginning: The Tomb - -). This page was last edited on 22 August 2015, at 13:45.